(Centerville, VA - May 12, 2017) - At the 2017 Annual Conference, April 18-22, at the Westin Kierland Resort, Scottsdale, Ariz., the Specialized Carriers & Rigging Association (SC&RA) announced the winners of the Hauling Job of the Year Awards. The competition awarded the performance of three SC&RA members who demonstrated exceptional skill and superior ability meeting some of the most difficult professional challenges encountered in hauling. 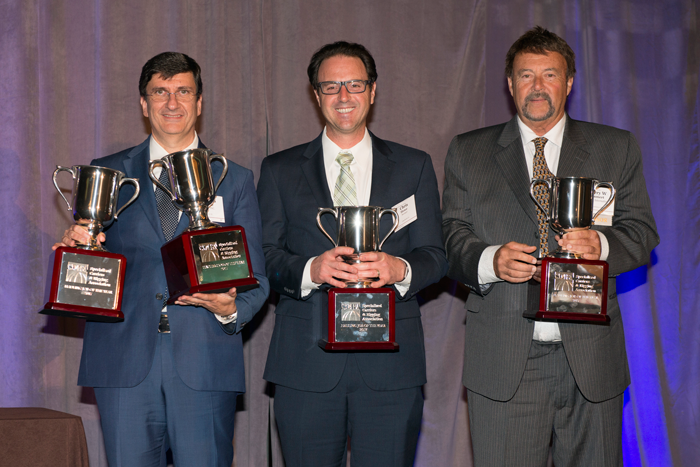 The winners were recognized for shipment routing, planning, overcoming physical elements, and safety considerations. Awards were presented to Fagioli SPA, Sant’Ilario D’Enza, Italy in both the Moving (using specialized equipment, such as self-propelled transporters, dollies, and crawler assemblies) category and the “Over 500,000 pounds (net)” category; Barnhart, Memphis, Tenn., in the “160,000-500,000 pounds (net)” category; and Emmert International, Clackamas, Ore., in the “Under 160,000 pounds (net)” category. Fagioli completed an astounding and complex high seas transport of a 4,500-ton Living Quarter (LQ) module. The module, which was sent to an offshore platform, measured 190 feet by 65 feet by 100 feet. Fagioli deployed 230 axle lines and 10 PPUs from its own fleet, together with transport beams, support towers, grillage beams, Ro-Ro ramps, and a mooring system. The marine transport used a 460 by 140 by 28-foot deck barge with an integrated ballast system and two 55-ton bollard tugboats. Operations were executed on a 24-7 basis with a double-shift team from June to October 2016. The project logged 1,600 engineering hours and 2,800 operational man-hours. Fagioli had their team undergo specific training in preparation for the transport and installation, performed job hazard analysis, daily toolbox talks, and had a thorough spill-control strategy in order to guarantee safety throughout the project. The “Santa Lucia” is Europe’s largest tunnel boring machine (TBM) and is made up of multiple 1,000-pound components, including a cutting wheel weighing 904,000 pounds with a 52-foot diameter. When this titan among TBMs needed to be transported from Germany to Italy, Fagioli met the challenge. The journey began by barge on the Rhine River, but after offloading at the Port of Ravenna, the Fagioli team still faced a daunting 105-mile journey across Italy. To complete the journey, Fagioli spent two months surveying and checking the route, organizing transport with several local and national road authorities, and analyzing the structural integrity of 96 bridges. A 30-axle line modular trailer pushed by two trucks, one positioned at the front and one positioned at the rear of the 223-foot convoy, was used to haul the largest sections of the Santa Lucia. A fleet of technical support vehicles, police cars, and escorts from the National Roads Assistance and Autostrade per l’Italia were all mobilized by Fagioli for assistance. The impressive project was executed on schedule and without incident through the journey. Barnhart International met an impressive challenge when they were tasked with transporting a new heat recovery steam generator (HRSG) from Tulsa, Okla. to Los Angeles, Calif. The 43-foot-long, 16-foot-wide, 16-foot -all, and 225,000-pound HRSG presented a special challenge not only because of its massive size, but also because its center of gravity was not longitudinally centered. Barnhart designed a trailer configuration that utilized two Goldhofer six-line California-style dual-lane trailers with seven-foot dollies and nine-foot one-inch axle spacings at 20-feet wide to keep axle loadings under 38,000-pounds per line. The next obstacle for Barnhart was transporting the massive HRSG across the ailing highway infrastructure of six different states – Oklahoma, Kansas, Texas, New Mexico, Arizona, and California. The haul obtained 21 local and country permits and got approval from 18 different local, county, and district DOT supervisors. Barnhart put in 240 man-hours with an additional 1,100 support hours from a safety convoy of bucket trucks and police escorts in order to guarantee the safety and efficiency of the journey. The Space Shuttle Endeavor completed 25 missions, but the 26th mission – transporting the only remaining external fuel tank to the California Science Center in Los Angeles – was awarded to Emmert International. In the spring of 2016, Emmert began “Mission 26, ET-94 Comes Home,” the final journey of the 66,000-pound, 155-foot-long, 30-foot-wide, and 35-foot-tall external fuel tank known as ET-94. Because of the delicate nature of the one-of-a-kind relic, Emmert faced especially stringent stipulations and exacting oversight from NASA throughout the trip. ET-94 began its expedition on a nautical route winding through Louisiana canals, the Gulf of Mexico, and the Panama Canal before docking at Marina Del Rey – the team even rescued four stranded fishermen on the way. Next, with the help of a hydraulically adjustable four-dolly transport system and three-dimensional, overhead-obstruction mapping, Emmert hauled ET-94 through the busy streets of Southern California to its new home at the California Science Center in downtown L.A. Barnhart logged 3,400 design hours and 1,500 crew transport hours in order to guarantee a safe ride for their precious national treasure. Berard completed the load-out and transfer of a 7,700-ton offshore supply vessel using 224 axle lines of Scheuerle and Goldhofer SPMTs, 8 PPUs, loading ramps, high-volume water pumps, and winch trucks. Burkhalter removed 10 bridge spans from the old I-95 bridge over West River in New Haven, Conn. using a complex multi-stage plan. Heavy Transport (Bragg) was tasked with moving a 100-plus-year-old California oak tree that was protected by state law but needed to be transported to allow for land development. Mammoet Canada took the lead on a rapid 19-day project redeveloping a three-level highway, The Turcot Interchange, involving the removal of a redundant rail tunnel in a very high traffic area. Nickel Bros. successfully completed a part land, part marine project that involved receiving the components of a new coal stacker reclaimer consisting of seven main pieces plus 91 components. Transdata used a multimodal plan to deliver 14 transformers in the Amazon Oriental region that included daunting infrastructure challenges and transportation via barge on the Xingu River. Barnhart transported three transformers – the heaviest at 585,100 pounds – from Maryland to Pennsylvania, overcoming challenges including 90-degree turns and major highway shutdowns. Precisions Specialized performed an international haul of a 169,800-pound boiler 2,360 miles from Nebraska to Ontario on a 13-axle transporter rigged with an eight-foot deck extension. Berard worked with the National WWII Museum to move a restored Patrol Torpedo boat from the museum to the Mississippi River. The trip, which included marine transport as well as navigation through the city streets of New Orleans, was donated entirely by Berard. Tradelossa transported two 155,000-pound condensers in a 1,532-mile journey across Mexico from Guadalajara Jalisco to Sonora.